I’m often asked, “How do I declutter”, how do I go about getting rid of my stuff ? – Get rid of your wishlists, they are designed to prompt you to buy things. Try and wait a month before you buy something, that way if you forget about it in that period, you probably didn’t need it. – Ask yourself, is it a need or a want ? [link] – So if you bring a new thing into your home, which item is going out ? – This is great for avoiding full wardrobes of clothes, kitchen items and consumables. – Sometimes, the one thing you really want is just that. A want, not a need. But if its a rare occurrence, and the rest of the time you feel that minimalism helps then don’t worry. There are no rules as far as I can see. No one’s telling you, you can only have a 100 items. Its your choice. – Occasionally people visit and say, wow, thats nice. Generally at the random stuff. Its a real pleasure and such an endorphin rush to say “here, its yours now” and just give it to them. I’m not saying you should give them your most prized possessions, but sometimes you just know when its right to hand things to others who see more value in them than you do. – My stuff tends to travel through my home. So keep an eye on the places in your home that stuff naturally migrates to. Make sure you recycle, repurpose, or give away the things that gather here. For me its the garage and the spare room. – I firmly believe that life is about experiences, not about things. So in my mind, a gift of an experience is far better than something physical, and often more thought is given into giving it. Who needs more socks for Christmas ? So for birthday’s, Christmas, and other giving occasions, why not give an experience. A meal out, a balloon flight, a picnic somewhere awesome, your time and attention, a trip to the zoo, seeing people you’ve not seen in a long time. Can you remember what you were given last Christmas, or birthday, or the years before ? If you do, I bet you remember the experiences far more vividly than the physical things. [link] – Thats avoid the free things. The goodie bag at the conference, the thing stuck to the magazine, the buy one get another one, the its too good to miss bargain. They are all ploys by marketeers and retailers to get you to buy their thing. Its just another thing to store, and more to the point, another thing you didn’t need until you saw it. You still don’t need it. 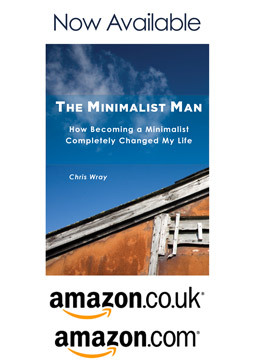 – You’re the Minimalist, not your family, friends, colleagues or anyone else. They can do what they like. Its not appropriate to force your beliefs on anyone else, not ever. – There will always be someone with less stuff than you, and someone with more. There’s no single number of things that’s right. Never compare yourself to others. They aren’t you, and never will be. 10) Why are you getting rid of your possessions ? – Are you sure you’re doing the right thing ? – Is this going to work for you long-term ? What are you doing this for ? Its always worth checking that Minimalism is really going to give you what you truly want. For me it was a form of freedom, and it gives me the lifestyle that makes me so much happier. Why are you being a Minimalist ? You need to write more often. For one so serious about this stuff, you need to live it.